Antioxidants protect cells from damage caused by unstable molecules known as free radicals (see Question 1&3). Laboratory and animal research has shown antioxidants help prevent the free radical damage that is associated with cancer. However, results from recent studies in people (clinical trials) are not consistent (see Question 2). 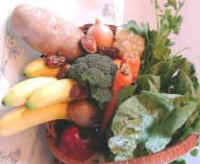 Antioxidants are provided by a healthy diet that includes a variety of fruits and vegetables (see Question 4). 2. Can antioxidants prevent cancer? Considerable laboratory evidence from chemical, cell culture, and other studies indicates that antioxidants may slow or possibly prevent the development of cancer. However, information from recent clinical trials is less clear. In recent years, large-scale, randomized clinical trials reached inconsistent conclusions. 3. What was shown in previously published large-scale clinical trials? 4. Are antioxidants under investigation in current large-scale clinical trials? Three large-scale clinical trials continue to investigate the effect of antioxidants on cancer. The objective of each of these studies is described below. More information about clinical trails can be obtained using www.cancer.gov/clinicaltrials, www.clinicaltrials.gov, or the CRISP database at www.nih.gov. • The Women's Health Study (WHS) is currently evaluating the effect of vitamin E in the primary prevention of cancer among U.S. female health professionals age 45 and older. The WHS is expected to conclude in August 2004. • The Selenium and Vitamin E Cancer Prevention Trial (SELECT) is taking place in the United States, Puerto Rico, and Canada. SELECT is trying to find out if taking selenium and/or vitamin E supplements can prevent prostate cancer in men age 50 or older. The SELECT trial is expected to stop recruiting patients in May 2006. • The Physicians' Health Study II (PHS II) is a follow up to the earlier clinical trial by the same name. The study is investigating the effects of vitamin E, C, and multivitamins on prostate cancer and total cancer incidence. The PHS II is expected to conclude in August 2007. 5. Will NCI continue to investigate the effect of beta-carotene on cancer? 6. How might antioxidants prevent cancer? 7. Which foods are rich in antioxidants? • Beta-carotene is found in many foods that are orange in color, including sweet potatoes, carrots, cantaloupe, squash, apricots, pumpkin, and mangos. Some green leafy vegetables including collard greens, spinach, and kale are also rich in beta-carotene. • Lutein, best known for its association with healthy eyes, is abundant in green, leafy vegetables such as collard greens, spinach, and kale. • Lycopene is a potent antioxidant found in tomatoes, watermelon, guava, papaya, apricots, pink grapefruit, blood oranges, and other foods. Estimates suggest 85 percent of American dietary intake of lycopene comes from tomatoes and tomato products. • Selenium is a mineral, not an antioxidant nutrient. However, it is a component of antioxidant enzymes. Plant foods like rice and wheat are the major dietary sources of selenium in most countries. The amount of selenium in soil, which varies by region, determines the amount of selenium in the foods grown in that soil. Animals that eat grains or plants grown in selenium-rich soil have higher levels of selenium in their muscle. In the United States, meats and bread are common sources of dietary selenium. Brazil nuts also contain large quantities of selenium. • Vitamin A is found in three main forms: retinol (Vitamin A1), 3,4-didehydroretinol (Vitamin A2), and 3-hydroxy-retinol (Vitamin A3). Foods rich in vitamin A include liver, sweet potatoes, carrots, milk, egg yolks and mozzarella cheese. • Vitamin C is also called ascorbic acid, and can be found in high abundance in many fruits and vegetables and is also found in cereals, beef, poultry and fish. • Vitamin E, also known as alpha-tocopherol, is found in almonds, in many oils including wheat germ, safflower, corn and soybean oils, and also found in mangos, nuts, broccoli and other foods. 1) Blot WJ, Li JY, Taylor PR, et al. Nutrition intervention trials in Linxian, China: supplementation with specific vitamin/mineral combinations, cancer incidence, and disease-specific mortality in the general population. J Natl Cancer Inst 1993;85:1483-91. 2) The Alpha-Tocopherol, Beta Carotene Cancer Prevention Study Group. The effects of vitamin E and beta carotene on the incidence of lung cancer and other cancers in male smokers. N Engl J Med 1994;330:1029-35. 3) Omenn GS, Goodman G, Thomquist M, et al. The beta-carotene and retinol efficacy trial (CARET) for chemoprevention of lung cancer in high risk populations: smokers and asbestos-exposed workers. Cancer Res 1994;54(7 Suppl):2038s-43s. 4) Hennekens CH, Buring JE, Manson JE, Stampfer M, Rosner B, Cook NR, et al. Lack of effect of long-term supplementation with beta carotene on the incidence of malignant neoplasms and cardiovascular disease. N Engl J Med 1996;334:1145-9. 5) Lee IM, Cook NR, Manson JE. Beta-carotene supplementation and incidence of cancer and cardiovascular disease: Women's Health Study. J Natl Cancer Inst 1999;91:2102-6.